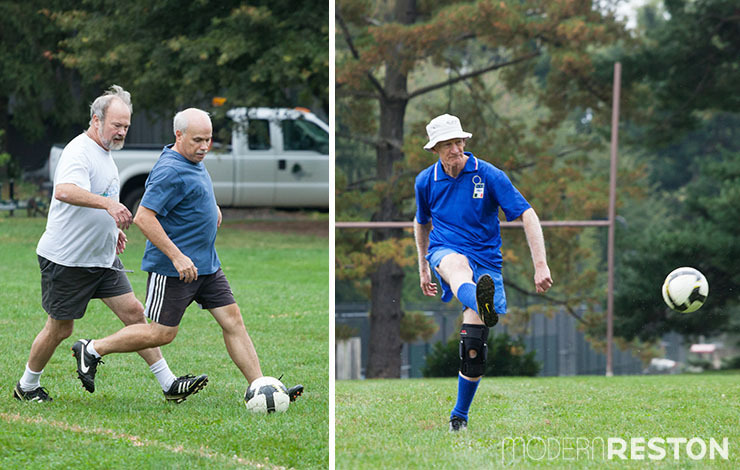 I knew I’d like these guys as soon as I heard that they call themselves the ROMEOS: “Retired Old Men Enjoying Outdoor Soccer – Women Welcome.” They are a group of Reston-area soccer lovers who get together once a week for an informal pickup game. People of any age or gender are invited to participate each week, but their most frequent players are men who haven’t let retirement slow them down. The ROMEOs are organized by John (“J.”) McCracken of Reston, and they’ve been playing weekly since March 2009. They meet every Friday morning at the baseball field at Hook Road in Reston. 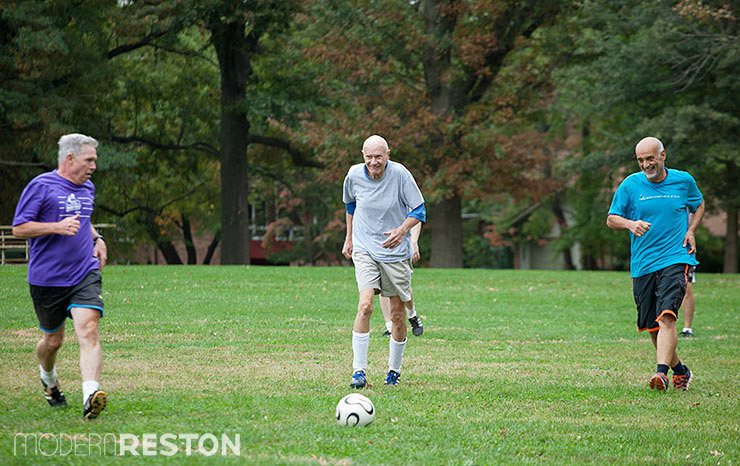 The players speak highly of this playing field – they say it’s in great condition and is well maintained by the Reston Association. They are even able to play through the winter and in most kinds of weather. J. describes the ROMEOs as “friendly but competitive.” “Our mantra is ‘no injuries’,” he says. They play hard and get a good workout, but avoid slide tackling and other risky situations. The day I watched them last week, the players ranged in age from 30s to 80s. Most were in their 60s and 70s. A variety of people show up each week, and anyone of any skill level is welcome. You don’t have to be a former college soccer star! Some of the ROMEOs didn’t start playing soccer until adulthood, including Fred Lenoach, who started in his 50s. He went on to play in a Fairfax County adult league for 20 years, and now plays regularly with the ROMEOs. Whether you’re new to soccer or have played it for many years, you’re welcome to join in. The ROMEOs will play any week that there are at least six people available. They are always looking for new players, and no commitment or payment is required. If you have a free Friday morning sometime, just pop by and play! You are also welcome to come to the park and watch any time you’re in the area. Come cheer on these ROMEOs. 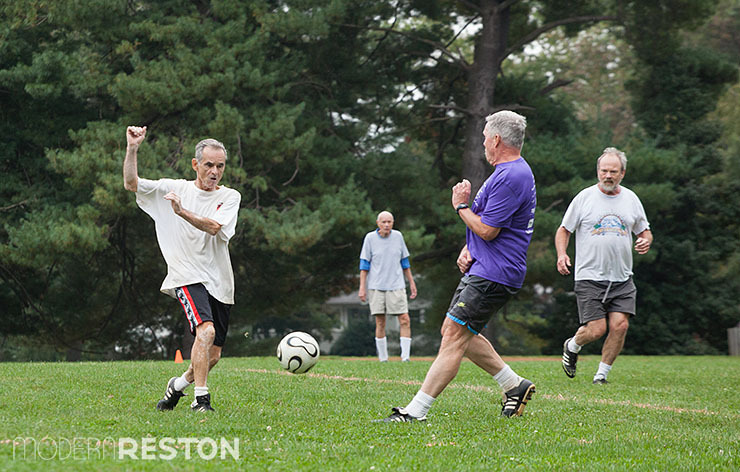 The Retired Old Men Enjoying Outdoor Soccer – Women Welcome (ROMEOs) play every Friday at 10:30am at the baseball field at Hook Road and Fairway Drive in Reston. Participation is free, and you can play any week that you’re available. You can show up unannounced, but they recommend that you contact J. McCracken at [email protected] in advance, just to make sure that there will be enough people to play that week. What other sports stories should we cover? Please comment here, or contact us at [email protected] with story ideas.